A clearing stood in an icy forest. A dragon named Boreas plummeted down from above, exhaling a white icy breath, freezing a tree solid, before charging into it, snapping it in half. A smirk. That would be effective on any dragon. He stomped around, repeating the actions on different trees at the side of the clearings. 5 minutes later, the clearing was... Clearer. The Trainee was large and muscular, and was destined to become a guardian, so creating these little combative moves to bolster his skills when the times came. Frostflare looked down at the dragon below. She new that he was a new icewing and they haven't met before. She flew downwards right in front of him, and before she landed breathed short breaths of ice spears the knock down the trees around her to make a clearing for her large body. She landed gracefully and raised her wings out and stretched to make sure that the sunlight shined through, then looked down on the trainee. She spoke to him, in a calm, slightly disgusted voice. "What do you think you are doing obliterating my forest?" The young dragon took a step back, slightly taken aback. "Practising... Things." he stuttered, his icy eyelids blinking. He had just seen the dragon before him clear out a few trees herself, just as he had done, and didn't believe he'd done anything wrong at all. 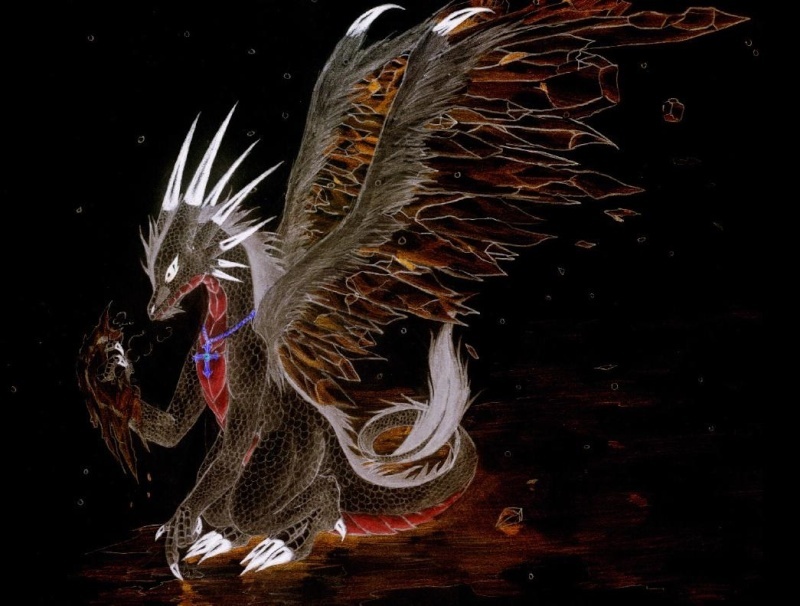 The youngster flapped his wings slightly, shuffling uncomfortably as this large dragon looked at him in disapproval. My alts are: Apollo of Firewings..
Frostflare shook her head. "You don't get it do you? This is my forest and I can do whatever I want with it. YOu on the other hand should go to the training grounds inside of a large pit at the foot of the mountain. Also, what made you think it was ok to destory a forest that you don't own?" The queen was disapointed with the dragon. She thought that this was basic knowledge that everybody should know. He flinched as she spoke, dipping his head low in shame. "I'm sorry, Ma'am. It won't happen again." he apologized, and took a few steps back. Still somewhat embarrassed and red-faced, the young dragon's felt a pang in his gut, as he felt her disappointment in him; he'd have to prove her wrong in a years time, that he isn't useless and stupid. Frostflare sighed. "It's fine, just don't do it again. Also, if you are going to call me something, call me Leader, Queen, or something like that. Speaking of names what is yours?" She questioned the trainee as she had forgotten to tell her's. A small whitish trainee, who'd been walking by from her most recent escapade, froze at the sound of the leader's voice, as well as another, newer one. Her head lowered unconsciously, worried that if she was found, she'd be reprimanded on one of her pranks. Again! That in mind, Wisp crouched down in the snow, the only thing visible becoming her emerald gaze, looking around curiously. "Boreas." he replied, puffing out his chest in relief. He looked much more relaxed, now he knew that his Queen was a forgiving type. Well, at least this time. Frostbite snickered as she watched a random IceWing trip over a vine, which set off a boulder, which halted against a large wall, but it was big enough to stop it AND send a medium sized rock down, which hit a plank, which sent a tiny anvil up in the air, and the wind was just on time. The wind blew gently, and the anvil shifted over to right above the IceWing and PLONK! The IceWing rubbed his head in pain, and glared at the anvil. But of course, he was under a snow tree, and the snow immediately crashed on him. Frostbite grinned. "Mission successful." She jumped when a boom was heard from a nearby forest, so she hurried to go check it out. Suddenly an ice shard came flying at her from nowhere, and she jumped into action. Her arm elongated into a sword, and she sliced it in half, and stared at the direction in where it came. There was an IceWing trainee she saw a few times around. Boreas, was it? And Frostflare was of course scolding him. Like usual. Frostbite decided she should make her appearance. "Hey!" she called, padding out from under the tree. "What's going on here?" SnowFall walked slowly, her scales blending in with the soft snow. Her tail was dragging and it almost seemed as if she were in her palace, walking like her regal manner. She came upon a small group of IceWings, which included her eldest sister, her fellow queen, and two IceWings trainees. One of them, Wisp, she had seen a while in her palace, but never had the time to introduce herself as a fellow queen. The other, well, she had never seen the male before. Stepping into the group, just right after Frost had finish her scolding, she presented herself, "Hello guys. How are you? Frostflare, don't scold him too harsh. But she is right, as Snow turned towards the trainee, "Don't go hurting nature. Especially in my territory." She told him kindly. "Now," she thought, "would be a perfect time to introduce myself." She turned towards the two trainees and said with a calm tone, "I'm SnowFall, please call me Snow and I'm excited to meet you two. I'm the other leader and I work with Frostflare, who you already met. Yes, this is my sister, as she nudged Frostbite in the ribs, "and.. she.. kinda.. plays a bit of pranks.. Actually, she oftens does it. And, yes, she has got me before also and I'm not afraid to admit it. And no, I cannot stop her. I've tried.. but nothing works on my older sister." Her eyes widened slightly when she was spoken to, though she'd not been trying particuarly hard in hiding, now that she thought about it. She listened quietly, however. When Snowfall had finished speaking, she attempted to put on a polite expression, though she was sure she just ended up looking pained. That was what she was told she looked like last time she tried to look polite. "Nice to meet you, Queen Snowfall," she said, her voice a level volume. She then glanced at Frostflare, a slightly amused look creeping on her face. "Hiya, Frost. Who'd ya get today?" The little trainee was quite taken aback at all the dragons, whom he didn't even know, all arriving. The shards of ice on his head dripped with icy dew slightly, as they began to melt, soon, he'd have to re-freeze himself to keep this frozen look, or he'd look like everyone else, cold, pale and white, which Boreas personally thought looked bleak and boring. Bliz decided to take a break from his usual work, while Melody was looking after the hatchlings. While soaring over the forest below he spotted a clearing which he hadn't seen before, within moments he saw his two sisters in a group of other Icewings, then quickly noticing Frost he decided to see what the commotion was about. As he landed with a thump close by he spoke "Hey guys whats going on?" Glancing over the new faces he guessed it was to do with them, but he had a feeling that Frostbite his sister had done something also, knowing her prankster ways. As he crept closer to the group his icy scales shun from the sunlight, keeping his gaze on his sisters he asked "Frost? your not playing tricks again are ya?" Frostflare roared at the others in rage. "When did I say that it was ok to cause an EarthQuake Frostbite! Don't think I didn't hear it from hear! Also Snowfall, I'm not being to harsh, just making sure that he doesn't do it again. Also Wisp, don't you have training to do? And Boreas, I will need somebody to give you a tour while I find my phsychopathic child." She gave the other dragons a dirty look, then took some time to calm down a bit. (Frostflare isn't pale and boring! She has Crystal wings! Wisp looked at Frostflare with wide, innocent eyes. "I can't train by myself!" She said. "All I can do lately is practice hunting!" Her voice rang with indignation, and she frowned slight, sitting and curling her tail about her talons, her wings drooping from her sides a bit. She'd been hunting all day every day, it felt like to her. That's all she knew to do. She couldn't practice fighting, she couldn't fight with anybody. They were always busy. She practiced flying sometimes, but there comes a point when flying becomes old hat, especially when you run out of ideas for new maneuvers. "Well. I think I'll be making an exit." he said sharply, not wanting to be a victim of a prank. He swiftly jogged across the clearing, and leaped into the air, before soaring away. Gosh, that was... Unique. he shuddered, and was quite bemused by that, the two leaders, another trainee and some other person. He needed to cool down, the icicles on his head were fast dissapearing.